Katherine is a town in Northern Territory, Australia. Keep things going the next day: tour the pleasant surroundings at Katherine Gorge, take an in-depth tour of Katherine School of the Air Tourist Room, then witness a stunning natural landmark at Katherine Hot Springs, and finally explore and take pictures at Katherine Outback Experience. To find reviews, where to stay, more things to do, and tourist information, use the Katherine day trip tool . Adelaide to Katherine is an approximately 8.5-hour flight. You can also do a combination of flight and bus; or drive. Expect warmer weather when traveling from Adelaide in April: highs in Katherine hover around 40°C, while lows dip to 24°C. Wrap up your sightseeing on the 12th (Fri) early enough to travel to Maleny. A large influx of people searching for a cooperative lifestyle migrate to Maleny every year. Kick off your visit on the 13th (Sat): admire the natural beauty at Maleny Botanic Gardens & Bird World, learn about wildlife with up-close encounters at Australia Zoo, and then get great views at McCarthy's Lookout. Get ready for a full day of sightseeing on the 14th (Sun): take in the dramatic scenery at Kondalilla Falls, then trek along Mary Cairncross Scenic Reserve, and then trek along Obi Boardwalk. To see where to stay, maps, traveler tips, and tourist information, read our Maleny trip planner. You can do a combination of flight and train from Katherine to Maleny in 12.5 hours. Other options are to do a combination of flight and bus; or drive. Expect little chillier temperatures when traveling from Katherine in April; daily highs in Maleny reach 30°C and lows reach 19°C. Finish up your sightseeing early on the 14th (Sun) so you can go by car to Noosa. Get out of town with these interesting Noosa side-trips: Mooloolaba (Mooloolaba Beach & Sea Life Sunshine Coast). 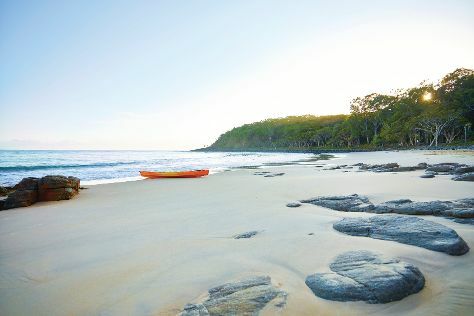 Spend the 15th (Mon) exploring nature at Noosa National Park. Next up on the itinerary: enjoy the sand and surf at Noosa Main Beach, hunt for treasures at The Original Eumundi Markets, and get a taste of the local shopping with Hastings Street. For more things to do, reviews, and other tourist information, you can read our Noosa online road trip planner . Traveling by car from Maleny to Noosa takes 1.5 hours. Alternatively, you can take a bus; or take a train. Finish up your sightseeing early on the 17th (Wed) so you can travel back home.